Four miles in and four miles out. Simple as that. 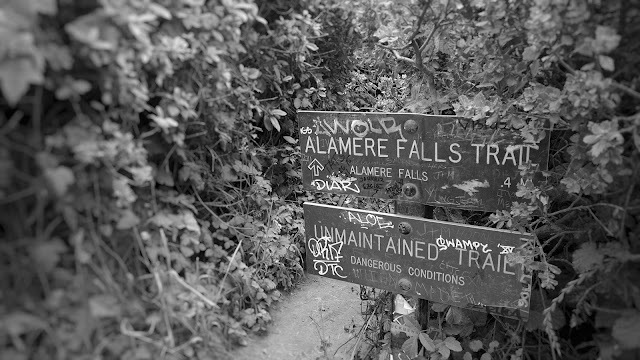 Except, of course, if you miss the left turn that leads into the last 0.4-mile unmaintained portion of the trail. The rest of the route is very well maintained, but that last 0.4 miles requires a little bit of squeezing in between height level vegetation on either side. Despite what other hikers may say, I don't think there was much, if any, poison oak. I was scratched left and right by the vegetation and I'm as itch-less as I can be. The waterfall was a little bit less impressive and anticlimatic, but maybe that's due to the drought. Regardless, it was a relaxing and leisurely hike. To get to the falls from where the trail ends, I had to do a bit of scrambling down some rocks, but nothing that would scar me for life. See photos of my Alamere Falls hike here. I missed this one from an earlier post.